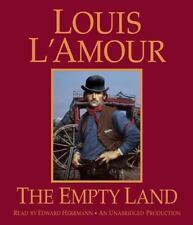 Lot of 10 Louis L'Amour Vintage Western Paperbacks The 10 shown are the ones you will receive. FREE SHIPPING. Condition is Good. Shipping will be media mail so allow ample time for delivery. Louis L'Amour Leatherette Book == PICK THE TITLES YOU WANT. The First Fast Draw. Treasure Mountain. Down The Long Hills. Bowdrie’s Law. The Rider Of The Ruby Hills. The Californios. The Cherokee Trail. 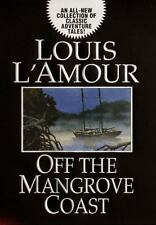 Author: L'Amour, Louis. Format: Mass Market Paperback. Condition: Good. They all appear to be in excellent condition. Maybe only read once. WHERE THE LONG GRASS BLOWS. THE HIGH GRADERS. OVER THE DRY SIDE. Up for sale is a Louis L'Amour Leatherette EditionSackett hardcover book. A reproduction of Louis L'Amour's signature deeply embossed into each front cover; Acid-free paper that doesn't age; Clear, readable type. This is a lot of 4 Bantam leatherette books by Louis L'Amour. Books are in good condition with all pages intact and no writing or highlighting. Binding is good. Photos are of the actual books you will receive. PRICE DROP! Pick from the list provided below. This is a collection of books from the 1980's and 1990's. They belonged to my father-in-law and have been in storage for many years. The majority of them are in great condition for their age (with a handful of exceptions, and even these are minor). Books are readable, text completed. No writing on text area. Book shows more wear and tear than a good book. Cover art may differ from stock photo. 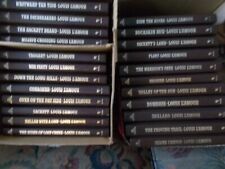 Louis Lamour books lot of 11. Condition is Good. Shipped with USPS Media Mail. A copy that has been read, but remains in clean condition. All pages are solid. the cover is intact, but may show scuffs or light creases, as well as a possible rolled corner. The spine may show signs of wear. Pages may include limited notes and highlighting, The former owner may have written their name inside the front or back cover. Unless otherwise explicitly stated here, there are codes or disks included with this purchase. Fast Shipping Monday through Friday!- Safe and Secure with tracking! These are copies that I do not think are good enough for collectors. The pictures I have taken above are a representation of the books I have and are not necessarily the copy you will receive. I have many other books - science fiction, fantasy, romance, western, children, young adults and others. 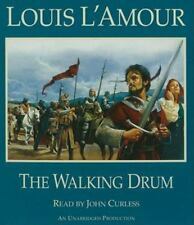 I have a TON of Louis L’Amour books up for sale this week. Check them all out! Our books are from a non-smoking house. The Hills Of Homicide: Stories. Louis L'Amour. Each story is personally selected and introduced by the author. Smell the leather. Feel the Old West. Louis L'amour Leatherette Cover Book. Printing 1983. Book Has No Writing Or Bent Pages. This is a lot of 4 Bantam leatherette books by Louis L'Amour. Books are in good condition with all pages intact and no writing or highlighting. Binding is good. THE SACKETTS. Conditions vary, and these are a mix of older publications and newer publications, most being good or better condition. A few of the older titles show more wear and tanning. Treasure Mountain. Treasure Mountain. Louis L'Amour. West From Singapore. The Man From the Broken Hills. Bowdrie's Law. Son of a Wanted Man. Rustlers of West Fork. Rivers West. This is the 1985 edition of Utah Blaine. 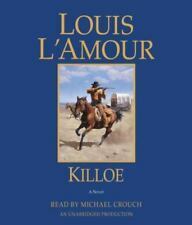 It is another classis by Louis Lamour. It is a leatherette hardcopy in very good condition and appears to be unread. Louis L'Amour paperback books lot of 6 titles in ok condition. Condition is Very Good. Shipped with USPS Media Mail. You are buying 1 lot of 6 Louis L'amour western novels. Condition is Good. Sackett - Book has noticeable crease on front cover and creased impression from book?. on back cover. 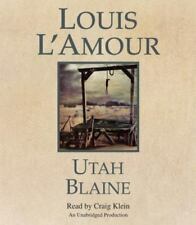 Louis L'Amour books. First Fast Draw, The. Buckskin Run. The picture is for reference only as there may be titles in the list that are not pictured. Key-Lock Man, The. Man From The Broken Hills, The. Trending at $6.67eBay determines this price through a machine learned model of the product's sale prices within the last 90 days. They are in well read condition. They're still an excellent collection for anybody that may be a fan. THE COLLECTED SHORT STORIES OF LOUIS L'AMOUR. LEATHERETTE HARDCOVER. Condition is Very Good. Books in above photos are the ones you will get. The Mountain Valley War. Louis L'amour Leatherette. Printing 1985. Book Has No Writing Or Bent Pages. Pictures Are Of The Item You Will Receive. Books Have Been Sitting On Den Shelf For Many Years. Louis L'Amour Collection Set: 14 Western Leather-Bound Books. They will arrive in a Box and they will be wrapped and secured inside to protect them during transport. Over on the Dry Side. Mustang Man. 44 Louis L’amour Books Lot paperback & 1 hardcover . Books are readable and have been read many times. Some have tape on the binding and some minor tears. Please look at pictures. No duplicates. Condition is Acceptable. Feel free to ask questions. Box weighs 14 pounds. Shipped with USPS Media Mail. Condition is Very Good. Law of the Desert Born, 1983. Bowdrie, 1983. Louis L'Amour leatherette books 3 volumes of short stories. Bantam books. Yondering, The Trail to Crazy Man, and War Party. Like new Condition. US Protectorates. Alaska Hawaii and. Milo Talon by Louis L'Amour (1981, Paperback). Condition is Good. Shipped with USPS Media Mail. Normal wear.